Introducing the NEW STANDARD in tissue slicing. 15º angle. Convenient Blade Holder Rest (11030) facilitates easy blade exchange. 11000 PELCO easiSlicer™ Vibratory Tissue Slicer each P.O.R. PELCO® Pro CA44 is an instant tissue adhesive based on cyanoacrylate. 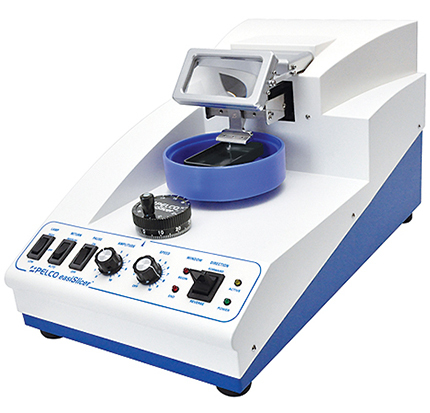 Developed to glue tissue on specimen holders used in vibratory microtomes. Although the tissue adhesive is instable in boiling water, it is recommended to use #19920 PELCO® Pro Cyanoacrylate Debonder to remove or clean cured cyanoacrylate. Supplied in 20ml bottle with dispenser tip, closed with PTFE coated steel pin for optimum seal. Comparable to Loctite 404 tissue adhesive. Useful for histology section manipulation, SEM, geology, forensic. Seamless ferrules, red enameled handles. #6 brush for larger brushing work on specimens. Measurements taken just above ferrule. For precise manipulation of TEM specimen grids and samples, dusting of SEM samples and photographic materials or photographic spotting. Sable hairs are springy and relatively fine. Length of hairs are short for better manipulation. Enameled wood handles and seamless nickel ferrules. Offered in packages of 3 brushes. Measurements taken just above ferrule. 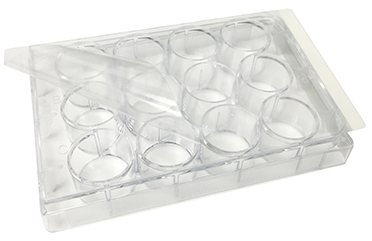 Tissue Culture-treated Plates are designed for a wide range of applications including general cell growth experiments, cloning studies, virus isolation and in vitro testing. Plate bottoms have a uniform thickness, allowing for distortion-free observation. Alphanumeric coordinates are placed on the same focal plane as cell growth, for convenient referencing of cell position. Gripping edges make handling easier. 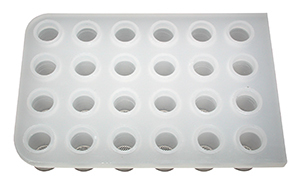 All plates have non-reversible covers with condensation rings to minimize evaporation and the risk of contamination. 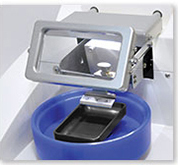 Plates are made of optically clear, medical-grade non-pyrogenic polystyrene, TC-treated, sterile and are used for processing of tissue on the bench or in the microwave. The corresponding Wellplate Inserts are No. 36168 for the 6 cavity, No. 36170 for the 12 cavity, and No. 36172 for the 24 cavity. SecureSeal™ is a thermal adhesive sealing film which consists of 2.0 mil polyolefin film coated on one side with pressure sensitive acrylate adhesive. 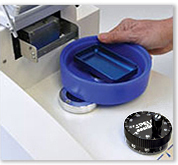 Designed to reduce spill-over and well to well contamination in tissue culture plates, SecureSeal™ also minimizes evaporation and vapor loss for PCR applications. This film has low autofluorescence and is functional from -70°C to +100°C. Certified RNase, DNase and DNA-free; DMSO resistant. Available in sterile and non-sterile packages. 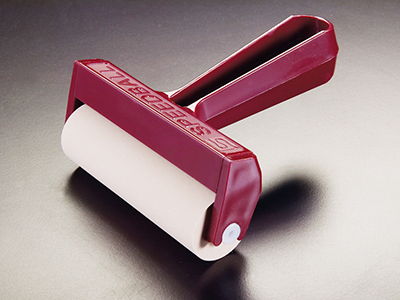 Roller made of medium hard rubber secured in a heavy duty handle. 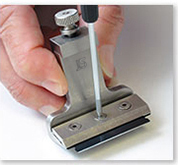 Manufactured with a comfort grip to assist in creating a perfect seal when used with SecureSeal™ Sealing Film. 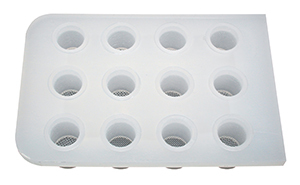 The rectangular polypropylene Wellplate Inserts have 6, 12, or 24 wells and will fit into the Corning Costar® Tissue Culture Plates of 6/12/24 Wellplate design. A 420µm opening, polypropylene mesh is at the bottom of each of the insert wells. 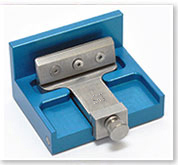 The Wellplate Inserts may only be chemically sterilized. Dimensions: 3-1/2" diameter x 1-1/2" high (89 x 38mm). 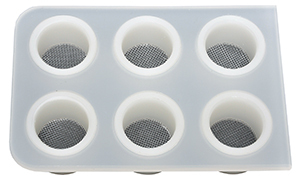 Available with netting of 32 mesh (left) or 64 mesh (right, shown in Staining Dish 36754-60). Rod in center of net can be grasped to lift net from Staining Dish.